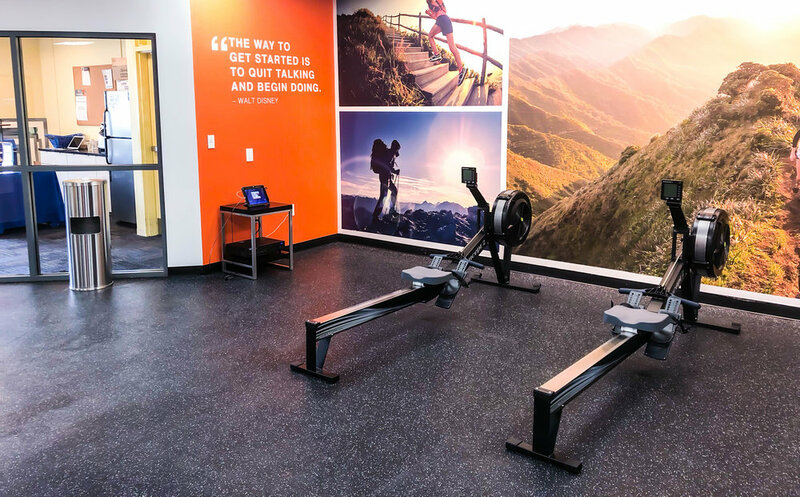 The project initially began after Olympus conducted a survey to determine how their employees wanted to use unoccupied space at their U.S. headquarters in Center Valley, PA. Their response was clear: a workplace fitness center. Now officially named “Mount Olympus,” the fitness center celebrated its grand opening in May 2018 after 16 months of planning and design with our team. Olympus’ purpose is to make people’s lives healthier, safer and more fulfilling every day. This includes the lives of their employees. The new fitness center plays a lead role in Olympus’ renewed commitment to Employee Experience, a key part of their corporate culture aiming to create a positive work environment while improving employee retention and aiding in talent recruitment. As part of their newly established company-wide Wellness Program, Olympus has put in place employee-led committees focusing on Healthy Eating, Fitness, Well-Being, Smoking Cessation and Financial Planning. They also boast an Olympus “Tough Crew” which includes employees who participate in local athletic and charitable events such as 5Ks, mud runs, and bike rides. Check out this beautiful new facility! Precor 800 Line cardio paired with P62 interactive touchscreen consoles. Precor power racks leading into a free weight and functional training area. The ever-popular Expresso bikes and Concept2 rowers add to the fitness center’s variety of workout options.